The Debating and Literary Society, Government Law College, in collaboration with Gateway House: Indian Council on Global Relations organized “The Policy Debate 2015” – the first of its kind, on the 18th of February, at the Convocation Hall of the University of Mumbai. 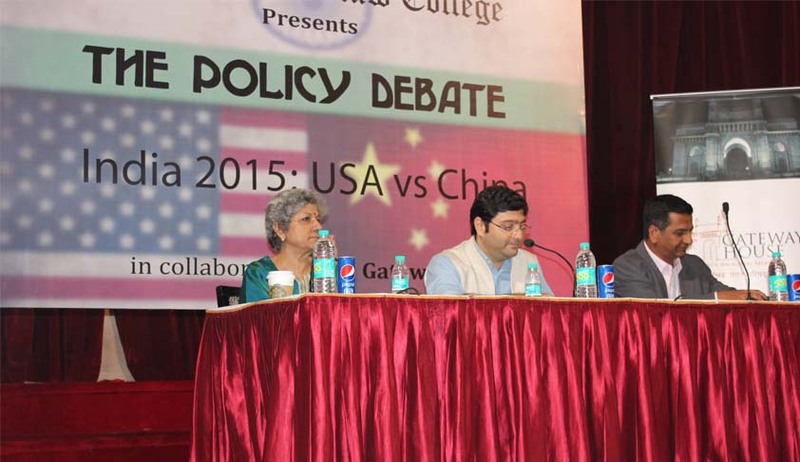 The debate revolved around the topic “India 2015: China versus USA” between erudite policy experts - Ambassador Neelam Deo and Mr. K.N. Vaidyanathan, and was moderated by Mr. Akshay Mathur. Ms. Neelam Deo is the Director of Gateway House, the former Indian Ambassador to Denmark and Ivory Coast and the Consul General in New York. Mr. K.N. Vaidyanathan is the Chief Risk Officer at Mahindra & Mahindra Ltd. and former Executive Director Securities Control Board of India. Mr. Akshay Mathur, is the Head of Research, Geoeconomics Fellow at Gateway House.The debate commenced with an introduction by Mr. Mathur. The two independent variables that will impact India’s economy in 2015 are the stability in South Asia, and China’s economic slowdown. India’s growth in the coming year will depend on whether this slowdown is orderly or disorderly. Ms. Deo predicted that China will be the largest economy of the world by 2016, even in dollar terms. Their current growth rate is 7.5%. There is little threat from USA because both the countries’ economies are so intricately linked through trade, that they shall either grow or sink together. However, the dependence of USA on China is considerably greater as China holds 1.2 trillion dollars in US treasury bills - the amount that USA needs to keep their current budget in balance. The solid base of the Chinese economy is what will ensure its orderly slowdown. The savings rate is 50% - half of what is produced, is saved. The shift in their economy from investment and export, to consumption of goods and services has resulted in higher employment rates. The slowdown in growth rate is 0.5% per year. An organized slowdown could see China and USA forming a G2. Ms. Deo ended her speech by stating that the prevailing economic stability will ensure that the Chinese will continue to enjoy growth and employment, but not the freedom that democracy brings. Mr. Vaidyanathan began his speech with an analogy. When children blow balloons, the balloon has to grow to a certain size for it to burst. This analogy hints at his stance – the swift ballooning of the Chinese economy cannot possibly have a positive outcome. The debate took a detour as we were introduced to a similar scenario in the 1980s – Japan was touted as the superpower that would overtake USA in the global economy. That is, until the Japanese stock market fell by 60%, export competitiveness by 75%, and due to the scarce local consumption, the economy crashed. History repeats itself. But if it doesn't repeat, it certainly rides. The parallels between Japan and China are far too strong to be ignored. China’s economy is export driven. There is an absence of local consumption. Manufacturing dipped from 14.5% in 2010 to less than 8% and continues to fall. Real estate is witnessing an artificial boom on account of ghost towns. China lacks two important features that may prevent economic chaos – demography and democracy. Due to stringent population policies, China is an aging nation. In the absence of democracy, there is no institutional framework to check the government. The chances of a disorderly slowdown are high. The result would be a strengthening of USA’s stronghold over the international community. A round of rebuttal saw Ms. Deo defending Japan, as it still is the third largest economy, today. The Japanese economy is stable and productive. She also deftly pointed out that China cannot be subjected to currency blackmail like Japan was. With alternative financial institutions like BRICS, and currency swap deals in place, China is not as dependent on the dollar as it was, before. Ms. Deo also stressed on the fact that the US President and Parliament are not working harmoniously, and with their crumbling infrastructure and social problems such as racism, China could well be the next Godfather of the globe. Mr. Vaidyanathan’s response was that the numbers from China do not add up. The economy is supposed to register a growth rate of 7%. The growth rate of housing is negative. That of the automobile industry is half its usual percent. The quality of data should be subjected to intense scrutiny. The discrepancies in these numbers show us that a disorderly slowdown of the Chinese economy is unavoidable. What are the implications of China’s number one position on India’s economy? If India supports China in its disputes in the South China sea, will it be detrimental to India’s relationship with ASEAN? To what extent will currency swaps aid India with reference to quantitative easing? If China relies heavily on exports, mainly dependent on other countries for support, then how strong is the Chinese economy? Would China’s slowdown be chaotic neat and orderly, or would it tumble into chaos? A show of hands revealed that both outcomes had equal support from the audience. The Policy Debate witnessed a confluence of great minds and thought provoking questions. It brought to us a greater understanding of international relations, the power play between nations, and gave us a glimpse into India’s exciting economic future.